Helen: I lived in Germany between 1989 and 1991. I was young, sure, but I do remember a fair bit. One thing that stands to mind about both German and Oklahoman Oktoberfests, is that the spirit of the countryside really comes to life at events like these. The difference between the two is that in Choctaw there is definitely an Okie flair. At Old Germany’s Oktoberfest you will find signs and shirts for sale with the phrase “Prost Y’all!” proudly screen-printed across the merch. And if you’re going out there with friends, then why the not toast as such? Honestly, it is probably more pretentious to try to do everything “Old World” style as though you don’t happen to live in the “New World” too. With that in mind, Stefan Morris and I set out on a mission to give cheers to good beers. Incidentally, I’ve been more mindful of researching my selections lately, but I have to say I was impressed with Stefan’s spreadsheet. 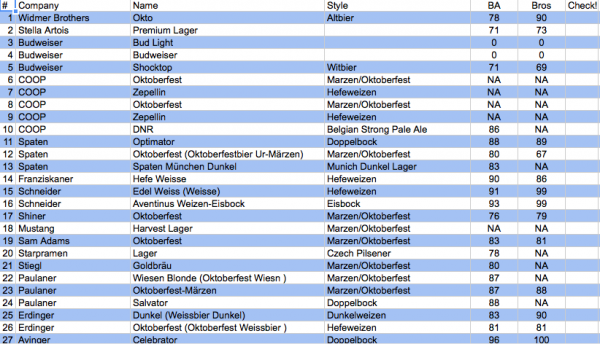 He imported information for all 46 beers as listed by style and their ratings on Beer Advocate. It was much more thorough than my “circle” a number on the Oktoberfest beer guide, which can be picked up in any of the beer tents, for each of the beers I’d like to sample based only on their descriptions. Even so, I found the spreadsheet to be helpful, especially if you happen to be uncertain if the item you’re eying on the menu is really worth the six tickets ($6) you are about to spend on it. Although it is worth noting that domestic brews will only cost you five tickets ($5). This is just the top half of the spreadsheet! The Weihenstephaner brewery is often credited as being the oldest continuously operating brewery in the world. For some people this is where beer starts and that is a good thing. Historically the Munich Helles style was created by German breweries to meet a growing German demand for Czech Pilsners. This beer will be very comfortable to people who are just recently straying away from mass produced American Pale Lagers while still rewarding a more seasoned beer drinker. I most recently sampled this beer in a classy plastic cup at Choctaw’s Oktoberfest. The coloration is light golden yellow with perfect clarity. The beer poured with an inch of white head that quickly dissipated. The beer was rather effervescent, even in such a terrible container, leaving only a ring of bubbles after the initial head. The beer smells slightly sweet in a biscuit and pils sort of way with a tiny bit of hop spice. The taste is more bready, with more of the light pils sweetness coming through. Hop bitterness is low, but present with more spice on the end than the nose would suggest. The light body and medium-high carbonation, along with the mild balanced flavors leaves the impression of a very crisp and refreshing drink. Overall, the beer is an exceptional example of the style, and is very, very, accessible to all beer drinkers. This is the perfect hot afternoon at Oktoberfest beer due to its refreshing and balanced qualities. I had to fact check this claim as Oklahoma isn’t exactly known for being exclusive in carrying niche beer. It would appear in the early 90s people had tried to introduce Paulaner’s Wiesen Blonde, but it didn’t go over well with Americans at the time. Which is a shame, since it’s not a terrible beer in the slightest. It is so light you could probably drink it all day. This might be a function of it being served in a plastic cup, but the head on the Wiesen Blonde was thick at first, but it dissipates quickly, and leaves little lacing. It smelled lightly sweet to me, but to be honest during the course of the Oktoberfest it was hard for me to distinguish scents as smoked foods, cigarette smoke, and other various odors wafted along on the breeze. It had a lightly almost floral forward with a hoppy finish on the back. Medium carbonation made it even more palatable. Because it was so light in body and overall flavor, I was reminded of Coors Light, but if Coors brewed beer that I actually liked. If only all organic beer was as tasty. Generally I’m wary of organic beer, wine, and spirits because I’ve yet to try one that wasn’t trying to sell itself solely on its organic merits, which is to say I’ve been disappointed more than once with these Eco-conscious offerings. That is not the case with Schneider’s Edel Weisse. It is a hazy golden-orange beer with a thick head that lasts for about 5 mins in a plastic cup. It leaves moderate amounts of lacing and it had a sweet citrus scent. There’s more of a citrus flavor than wheat one, and this beer finishes with more hoppiness than I would have expected from Hefeweizen. It was very carbonated, which made it feel like it was dancing all over my mouth, yet overall it was a pretty light-bodied beer. 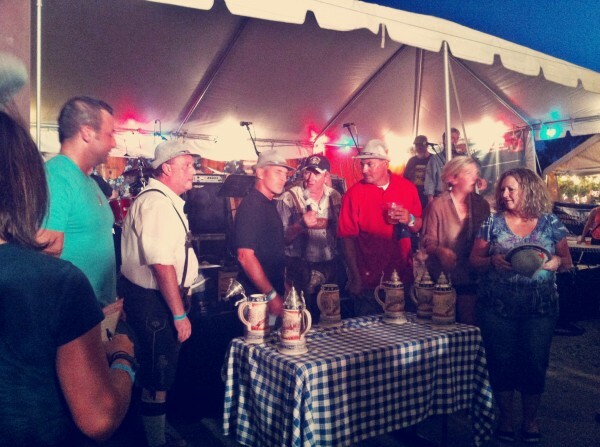 A beer stein holding contest. Winner walks away with swag from Sam Adams. I’ve come to the conclusion that Ayinger can do no wrong. This is a hazy amber-orange beer that smells sweet and malty, pretty much tastes like it too, and unlike the other beers I had been trying, I found it did not have a very citrus-like hoppy finish. It’s hop flavors were more grassy. Not a lot of lacing on this beer either. I think it lives up to it’s claim, although I would put it more towards a medium body. The carbonation was medium as well. In fairness, all the Oktoberfest beers are on tap, so it’s going to be different than having it out of a bottle. Gordon Biersch is a California based brewery and restaurant chain that focuses on producing German style brews, and is one of the few American beers that you will find at this year’s Choctaw Oktoberfest, along with our local favorite COOP, and the domestics which shall not be named. This beer poured a medium amber color with good clarity. The half inch of off-white head was poorly retained and faded quickly into nothingness. The smell was straight baked bread with a bit of toasted character. More of the toasted bread complexity came through but with an overly caramel sweetness as promised by the beer guide. Some hop bitterness is found in the middle before finishing on a slightly sweet note. The beer was medium bodied, with medium-low carbonation, and a somewhat sticky mouthfeel. While not a bad beer, I was overall unimpressed by this take on an Oktoberfest. My major complaint was that the beer was too sweet, with a poor finish. While the sweetness wasn’t cloying, it certainly prevented this from being a more refreshing drink, such as Paulaner’s marzen. It also lacked the flavor complexity of Ayinger’s marzen, or even the local COOP offering with its more aggressively hopped approach. As all of these other marzens and then some can be found just a few tables away at Choctaw’s Oktoberfest I would pass on the Gordon Biersch Marzen. 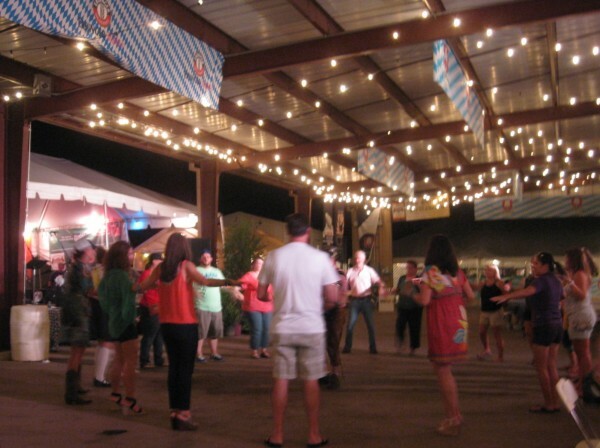 The Chicken Dance: after an Eisbock or two, you will likely find yourself gathering in a circle ready to frolic under the pretty lights. This lives up to the claim and then some. Forget a hoppy finish, it’s more like an alcohol finish. It is dark, smells sweet and malty. Taste wise, I found it’s a bit cloying as there’s a light viciousness to it. After a few sips, I noticed it had a medicinal taste that wasn’t wholly unpleasant, but I wouldn’t want more than one of these beers in a sitting, if not for alcohol content, then for how much it starts to taste like Elderberry syrup after awhile. I could see buying this for myself and saving it for a night I want to stay in and watch a movie or read a book. That said, this was one beer that went quick. I don’t know if they have had a chance to restock, but if you’re wandering around out there it’s worth trying. Eisbock is a beer that starts in a style that is very similar to a doppelbock, but has also gone through the process of freeze distillation. In freeze distillation the beer is partially frozen and then the solids are removed. Due to the differing freezing points of water and ethyl alcohol, more water than alcohol is removed in the ice, which concentrates the beer into something truly special. An apocryphal story places the origin of this beer style in Kulmbach, Germany around 1890, where a lazy brewery assistant left a barrel of beer outside in the freezing cold. The brewmaster supposedly punished the assistant by making him drink the dark sludge left in the frozen barrels, making the assistant the first person to have this excellent style of beer, which punished nothing but the assistant’s liver. The Schneider Eisbock is a wheated version of this style and is one of the best values you will find at Choctaw’s Oktoberfest. Your $6 in beer tickets will get you 16 whole ounces of nearly black, highly carbonated, and highly alcoholic ambrosia. The smell of this beer is dominated by strong alcohol notes, raisins, and darkly roasted grains. The taste delivers more of the same with an almost herbal cough syrup like sweetness, rye like flavors, a bit of indeterminate fruit, with a strong cloyingly sweet and bitter finish. The mouthfeel is thick, and sticky with heavy alcohols trying their best to clear the syrup, but failing utterly. Make no mistake, this is not a refreshing beer. Do not drink this to combat the heat of the day and for heaven’s sake do not have too many of these if you don’t fancy the idea of passing out and becoming a traditional Oktoberfest bierleichen. However, this beer is fantastic at lubricating a conversation, and the flavors are just so bold that it really must be experienced firsthand. 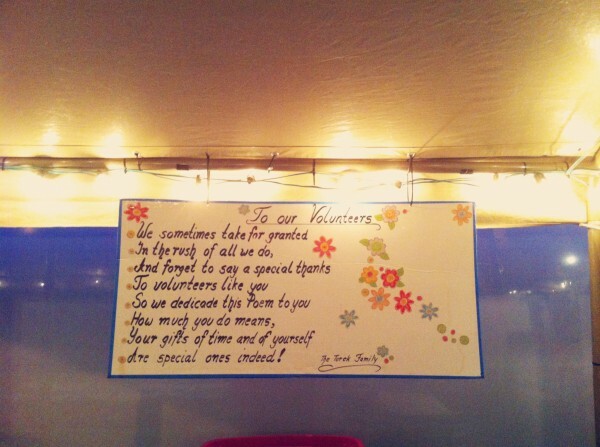 The Turek family appreciates its volunteers. Stefan: While the beer offerings were really quite solid, the food provided by Old Germany was lacking. The selection of dishes were limited and the quality seemed fairly low. Having visited the restaurant when it is not in the throes of Oktoberfest, it is obvious that they cannot maintain the same standards when cooking for a whole festival, although we never sampled the pretzels and strudel so I cannot speak to their quality. That being said, after a few strong beers, glasses of wine, or Jager shots you shouldn’t mind too much. As mentioned earlier, the atmosphere is considerably rural. When not playing the chicken dance for the 3rd time in an hour the bands are as likely to be playing a country standard or a twangy rendition of an Elvis song as they are to be playing polka. I suppose it is no less abrasive than any other Oktoberfest celebration, but we found ourselves seeking out seats in the farthest corners of the tents, which at times didn’t seem far enough away from either of the two stages. The event was fairly family friendly, and the adults seen drinking in the early evening appeared to do so in a mostly responsible manner. A few inflatable rides, slides, and climbing walls were available for children, or children at heart. Other than the dancing, drinking, singing, and rides a few knick-knacks and beer steins could be purchased from a vendor. This rounds out most of the activities that are to be found at the Choctaw Oktoberfest. 5 p.m. to Midnight. Last call 11:30 p.m.
12 p.m. to Midnight. Last call 11:30 p.m. Parking is free. Entry per adult is $5. Children under 12 have free admission. Drink and meal tickets cost $1 per ticket/$10 per sheet of tickets. Any Sausage Dinner (Knackwurst, Bratwurst, Smoked Bratwurst, and Frankfurter): 10 tickets. Grilled Rippchen (Smoked Pork Chop) Dinner: 11 tickets. Grilled Chicken Dinner: 12 tickets. Ham Hock Dinner: 22 tickets. Turkey Leg Dinner: 12 tickets. Any Sausage on a Bun: 5 tickets. Side of Sausage: 4 tickets. Potato Pancakes (2): 3 tickets. Red Cabbage, Sauerkraut or Potato Salad: 3 tickets. Imported Beer: 6 tickets for a 16 oz cup. Domestic Beer: 5 tickets for a 16 oz cup. Coffee, Pretzels and Strudel are available at the Backerei Tent. For more information check Old Germany’s website or follow them on Facebook. Tagged Ayinger Oktoberfest, Backerei Tent, beer, Coors Light, Friday Sept, Germany, Oktoberfest, Old World, Paulaner Wiesen Blonde, Saturday Sept, Side Dishes, Wiesen Blonde. Bookmark the permalink.